With its spacious alleys and white marble buildings, the central part of Ashgabat feels very deserted. The only sound here comes from countless fountains. Occasionally you meet cleaning ladies who sweep and even mop the pavements relentlessly. And yet you cannot shake the feeling that you are being watched. A man in civilian clothes with a walkie-talkie appeared from the other side of the street shouting to me to stop when I tried to take a camera out and film. Police officers on guard along the streets serve as a reminder that Turkmenistan is one of the most repressive states in the world. Even when you are driving, they can be around you. My small camera, attached to a side window, captured a police officer in a car. He was staring at the lens and frantically talking on his phone. Maybe he was just overtaking my car, but such encounters fuel fear among citizens and enforce obedience. And fear seems to be growing. When I visited Turkmenistan seven years ago, it was striking how unafraid people were to interact with foreign journalists. Back then, they praised the government for free gas and electricity supplies, cheap fuel and food. It reminded me of my political theory class at school about the social contract - the state provides economic benefits while in return, citizens do not challenge the state. Today, it feels this arrangement is not fully working. "My salary is barely enough to feed my family," said one Ashgabat resident. "So what if we have huge energy resources? Ordinary people don't gain much from that. They have even installed gas meters in our flats." Gas and electricity are no longer free. "Prices for meat and transport have gone up," complained another resident. "But people don't protest. They are afraid, not just for themselves but also for their families and relatives since we have collective punishment here." Sitting in a restaurant booth and describing hardships, my companion suddenly froze. His eyes were fixed on the door where a waitress had left a sticker note. "Why did she do that?" he asked nervously. It turned to be just a note about a booking for the booth. The human rights situation in Turkmenistan remains "abysmal", said Rachel Denber from Human Rights Watch. "There is no freedom of expression, no freedom of association and no freedom of religion," she said. "It's a country where people live in fear of the authorities at every level… even if it's something as simple as getting an air conditioner in summer time." And yet Western governments and companies court Turkmen officials in order to gain access to the country's massive gas fields. Turkmenistan has the fourth-largest gas reserves in the world, and top energy companies gather here for an oil and gas conference every year. Each exhibition stand has a portrait of Turkmen President Gurbanguly Berdymukhammedov. At the end of the event, conference participants thank the president, holding his picture in front of TV cameras. The EU is also keen to cooperate with Ashgabat. Officials are currently negotiating the construction of a pipeline under the Caspian Sea to ship Turkmen gas to Europe. The EU representative in Turkmenistan, Denis Danilidis, argues that reform will follow. "We do not shy away from issues like human rights or rule of law," he said. "Quite the contrary. But we discuss them in a positive way. "And by committing ourselves to such a project like a Trans-Caspian pipeline… our dialogue will be deepened and will allow more trust, which will also [have an effect] on our discussions of issues like human rights." However, activists believe this is just "wishful thinking" and Western actors need to make clear their expectations regarding human rights from the Turkmen government. Turkmenistan remains one of the most isolated states in the world. 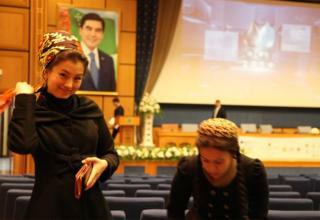 The spread of mobile internet has brought some changes, allowing Turkmen citizens to interact with the outside world. But all internet activity is monitored. You need to register and present your passport when buying a Sim card or going to an internet cafe. And most social media and opposition websites are blocked. "The government makes it absolutely impossible to have any kind of alternative," said Ms Denber. "And the price of pursuing those alternatives is prison - long sentences and possibly worse."